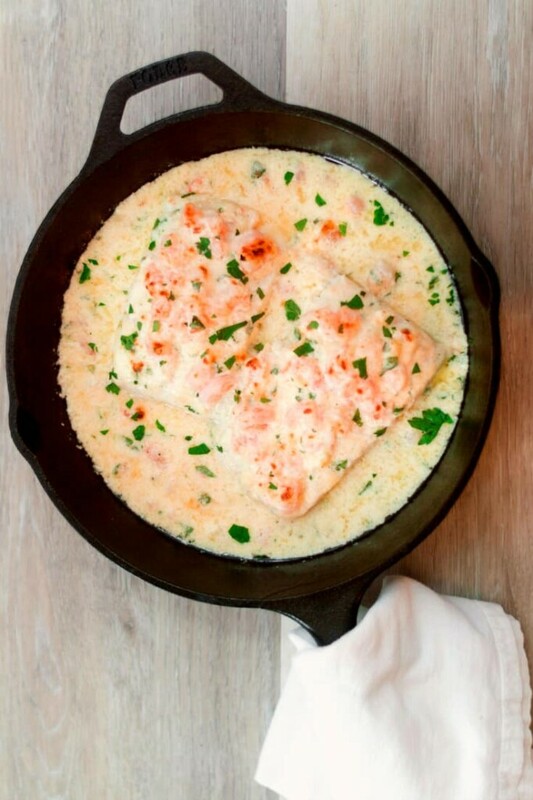 This Alaska Halibut Topped with Creamy Parmesan Shrimp Recipe was sponsored by Alaska Seafood as part of an Influencer Activation for Influence Central. The recipe and all opinions expressed in my post are my own. Does your family celebrate Lent by eating meatless? We do — or at least try to — but when my kids were young, that meant a nightly struggle to find meals they’d eat without non-stop complaining. Sure, they were fine with fish sticks and pasta recipes, but after a few nights of that, I craved something more substantial. I wanted to make sure they were getting the protein that growing bodies need while helping them learn that fish doesn’t have to be deep-fried to be delicious. Fortunately, my kids both love shellfish and cheese, so one night I decided to create a meal that combined what they like with what I love. 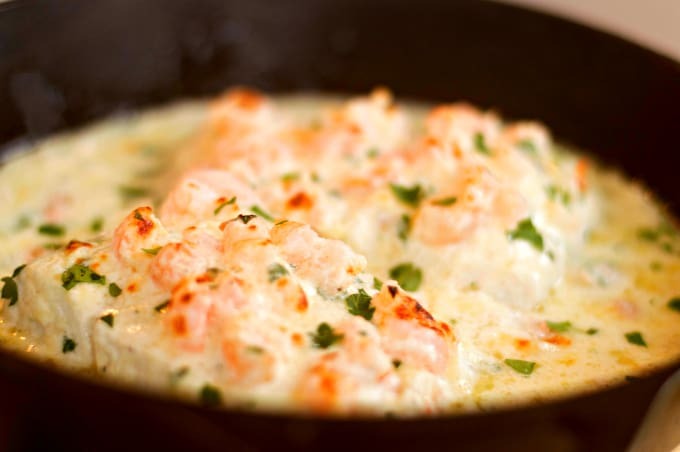 Thus, this Alaska Halibut Topped with Creamy Parmesan Shrimp Recipe was born. And did I mention this is a 20-minute dinner recipe? Or that it’s so easy that kids old enough to use a knife can practically make it themselves? 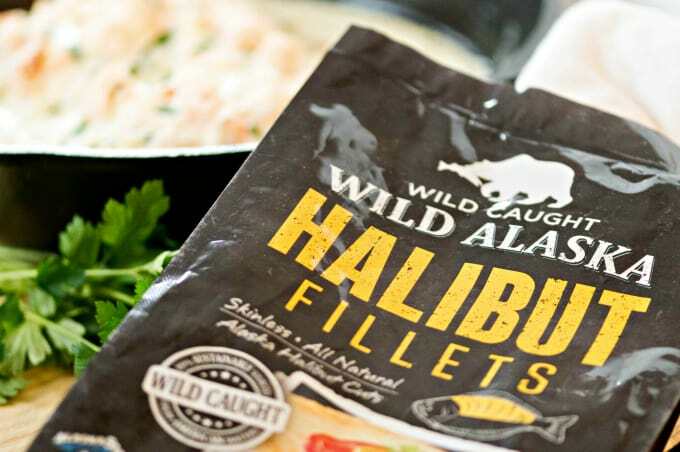 When you start with Alaska seafood like halibut, sole, cod, or sablefish, you’re getting high-quality, lean protein caught wild in pristine coastal waters. Those cold depths are such a perfect environment for fish that nearly 60% of seafood harvested in the U.S. comes off the shores of Alaska. That’s an important thing to remember: when you ask for Alaska at the grocery store or restaurant, you can feel confident that you’re eating the best, most sustainable seafood in the world. It’s easy to find fresh or frozen, too — I picked up my Alaska halibut at Walmart! One thing about Lent — it’s not always easy coming up with something both kids and guests will enjoy. But this meal satisfies everyone! Pair it with a tossed salad and wild rice or even pasta and, voila, you’ve got a meal you can feel proud to serve. Defrost frozen Alaska halibut in the refrigerator overnight if possible. If you forget, don’t panic! The fillets come individually-wrapped, so place them in a bowl of water for 15-20 minutes. Weight them down if necessary, and change the water every 5 minutes. It’s okay if your Alaska halibut filets are still a bit frozen when you start this recipe. Just add another minute or two to the cooking time. Test for doneness by seeing if the center flakes easily with a fork. 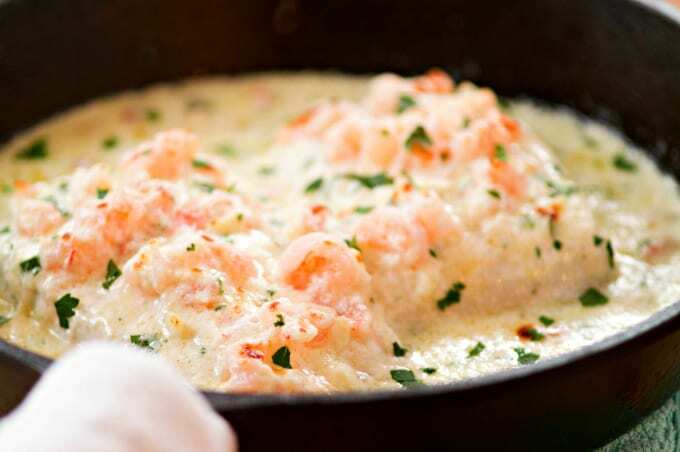 This 20-minute meal features firm, mild halibut topped with a deliciously decadent shrimp sauce. It's easy enough for weeknights but elegant enough for company! Preheat oven to 450°F / 200°C / gas mark 6. Liberally season the fish with salt and pepper and place it in a baking dish. Chop the shrimp and transfer it to a bowl. Add the melted butter, sour cream, Parmesan cheese, and garlic. Stir in half of the minced parsley. 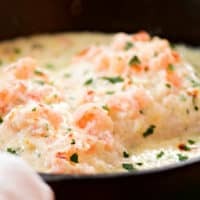 Spread this shrimp mixture evenly over the halibut filets. Bake at 450°F for 12 minutes. Halibut is done when the center flakes easily with a fork. To brown the top, turn the oven to broil and cook for 2-3 more minutes. Garnish with remaining minced parsley before serving. 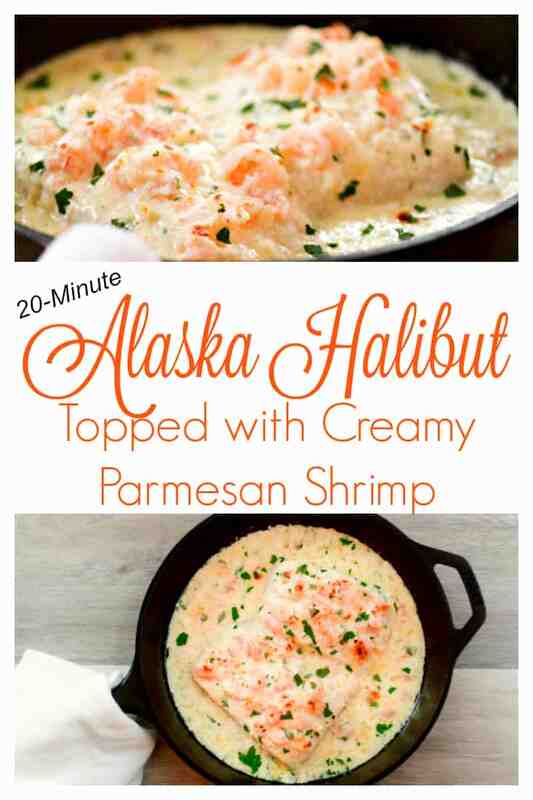 For more recipes featuring Alaska Seafood, follow them on Facebook or Instagram!